As I mentioned in a previous post, we came to Malaysia because we tried Penang and Mussaman curries in Thailand and loved them. Well, we found out much later that these are not Malaysian curries at all, but Southern Thai curries. So, our entire reason for visiting Malaysia was based on a misunderstanding. No matter, because we loved the food in Penang even more than the curries that brought us here. 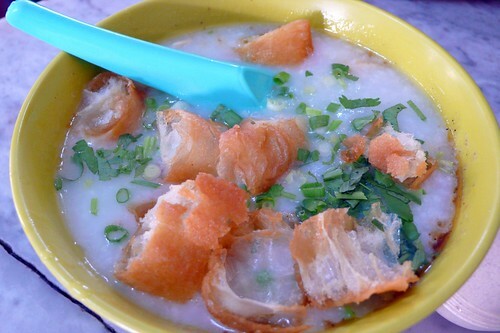 Penang is known throughout SE Asia for its amazing food. This owes a lot to the clash of cultures that exists here…Indian spices, Chinese noodles, and Thai herbs flow freely into the Malay dishes. Plus, the food is cheap! We had only 1 restaurant meal the 4 days we stayed here, and ate at food stalls the rest of the time, with our dishes costing between 2 and 5 ringgit (aprox. US$0.50 to US$1.50). Even better, the portions here are small, so we could eat about 6 meals a day (splitting the dish each time, so we weren’t really THAT gluttonous). After losing a few pounds in Thailand from our stomach flu, we could afford to overeat a bit anyway. Food stand eating is quite convenient in Penang. Not only is it fast and cheap, but there are usually small plastic tables set up nearby so you can actually eat your meal at a table. Basically, it’s just like eating at an open-air restaurant. At the New Lane hawker center. Below is a selection of dishes that we really enjoyed. Curry mee is a noodle soup with a coconut milk base. 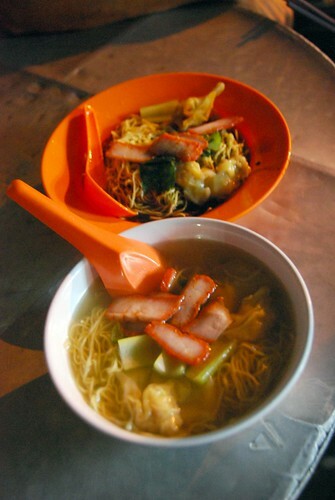 This was by far our favorite dish in Penang—so nice we ordered it twice! Interestingly, in Penang, noodle soups are often made with both egg and rice noodles—two great tastes that taste great together. 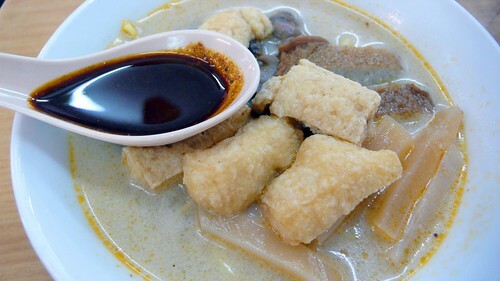 Curry mee also includes fried tofu, bamboo shoots, cubes of pig’s blood (thankfully, we did not know what this was until later…we tried it and didn’t mind it), and snails (didn’t know what this was either when we ate curry mee…tried one, didn’t like it). It is served with a spoonful of hot sauce on top; you drop the spoon in and mix the hot sauce with the curry broth. It is really spicy and rich and delicious. My mouth is watering just writing this. 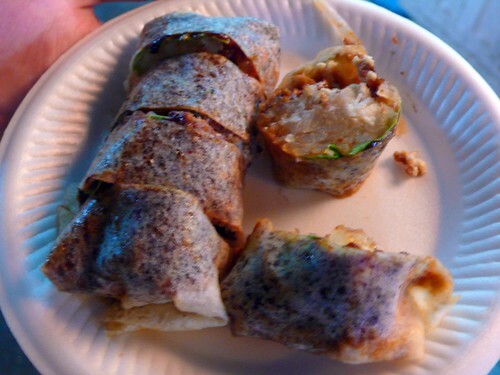 This is a small roll filled with some sort of brown sauce (maybe hoisin? ), lots of shredded yam bean, dried bean curd, and some sort of meat (we read that it was crab meat, but we think ours was filled with chicken). All of this is wrapped in a fresh spring roll skin. Because of the yam bean, this roll is super juicy, not dry like most spring rolls. It is absolutely incredible…we were shocked by how tasty and delicious it was, especially since it doesn’t really look like much on the plate. Again, another winner. 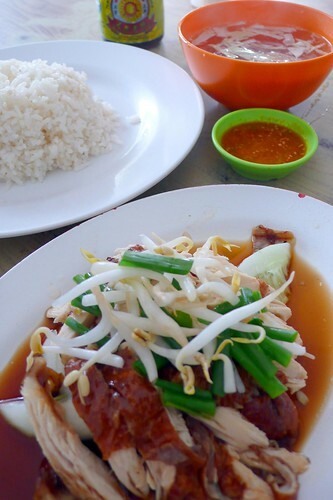 This is simply roasted chicken (sometimes they sell it with boiled chicken—be sure to find a stall that sells roasted chicken since it is much, much tastier) with bean sprouts and green onion served with a scoop of rice, a small bowl of chicken broth, and an amazingly delicious chili sauce with ginger. Mix all of these elements together, and you get one of the best meals we had in Penang. Sounds simple, but the flavors are each so distinct that it makes this dish a standout. This dish is quite different from regular chicken rice. 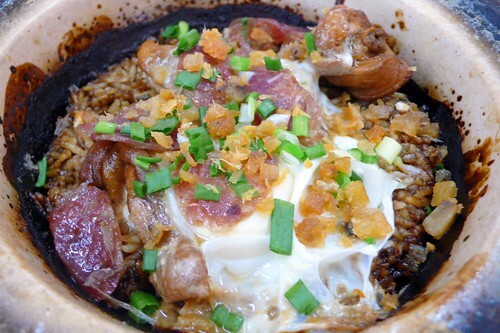 The claypot is placed on top of the range, with a scoop of rice and a dark brown liquid (we think it is a very light soy sauce mixed with other goodies) thrown in. It also includes chinese sausage, stewed chicken, and an egg. This dish sounds like it might be heavy (due to the soy sauce mixture that the rice is cooked in), but it surprisingly light. Also, the crispy rice at the bottom of the pot is a delicious treat. Nasi kandar is a generic term for “Indian stuff with rice.” You can choose any number of curries, fried treats, roasted meats or veggies to go with your rice. They sell it everywhere in Penang and you could probably eat nasi kandar at every meal and never have the same thing twice. We actually had this dish in the ferry building in Langkawi. 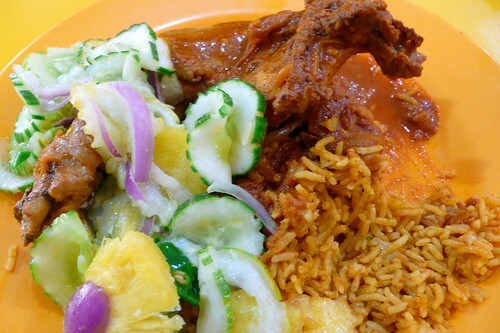 It is chicken masala, curried rice, and cucumber and pineapple salad. Congee or jook is Chinese rice porridge, and I grew up eating it on the weekends for breakfast. I used to eat it plain with sugar, but in my adulthood I have come to enjoy salty jook. Jeremy loves this stuff too, maybe even more than I do. 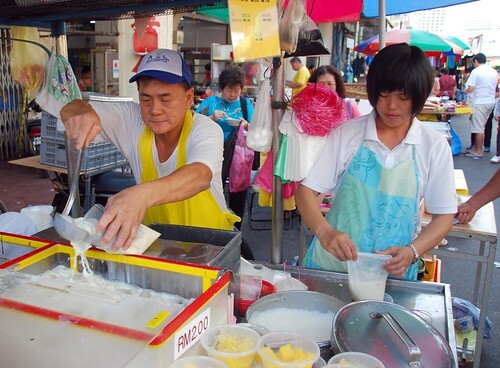 In Penang, we had it with salted and preserved eggs and chinese fried dough. We will be eating a lot of this when we get to Taiwan. Stay tuned. 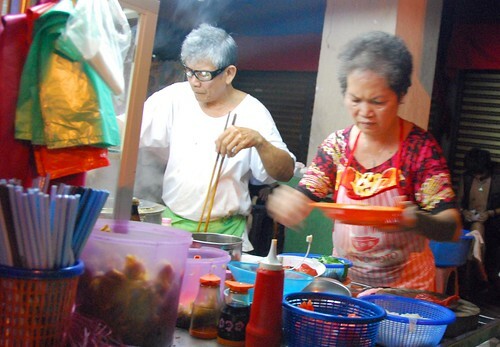 There are two roasted chestnut vendors at the Chowrasta market off of Jalan Penang. 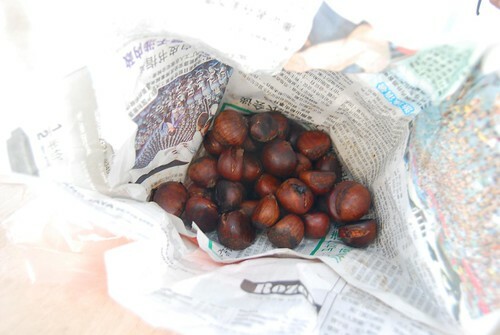 I remember when I was a kid my dad used to make roasted chestnuts and I always loved them. They are mildly sweet and make a great snack. 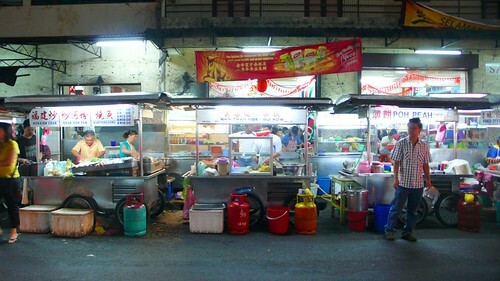 We happened upon this food stall one night and had a quick and simple dinner. It’s just a simple noodle soup with barbecued pork and veggies on top. The stir-fried noodles have some soy sauce mixture poured over them. It’s really yummy. Unfortunately, I guess I forgot to take a picture of this dish. It is an Indian bread fried in ghee that can come stuffed with goodies like egg and onion. You get a curry dipping sauce with it and it is greasy and delicious. Not a meal, but worth mentioning anyway. 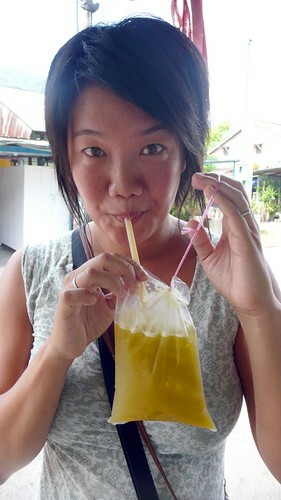 You can all kinds of fresh-squeezed juices in Penang (we also really liked the starfruit juice). If you take it “to go,” they dump it in a bag with some ice—no plastic cups here. Hokkien mee is a spicy noodle soup with prawns and Chinese cabbage. We didn’t love this dish because it is very fishy tasting, even for us (we love fish). We think the broth is made with dried shrimp, which gives it a very strong, almost smoky flavor. 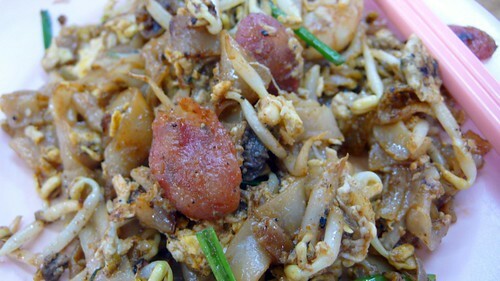 This is basically a stir-fried noodle dish with flat rice noodles, chinese sausage, bean sprout, and egg. It was fine, but not one of the standouts. Maybe if I tried one of the other char kway teow vendors? Sorry, again, no photo. We may have ordered this from the wrong place…we got it from a Muslim hawker stand because they were the only ones not harassing us to eat at their joint. 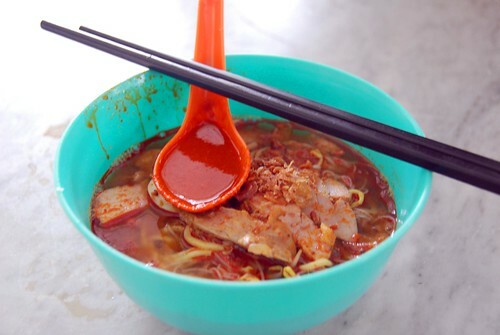 Laksa is not a Muslim dish, however (it’s Malaysian), so it may be better at another food stand. Also, it’s worth noting that laksa in Penang is different than laksa elsewhere in Malaysia—the broth is much fishier and there is less coconut milk used. We want to give a special shout-out to the people running the food stands. These people are amazing! They are super fast, they work long hours, and they often speak several different languages. We should have gotten video of some of these people working…their hands move so fast, they look like martial artists! Hi-ya! Soy milk vendor at Chowrasta market. Char siew noodle soup stall on Lebuh Chulia. As you can probably tell, we loved Penang. The food is great, we love the mix of different cultures all living together peacefully, and best of all, there are not that many tourists here as compared to other parts of SE Asia. We had a nice time climbing and swimming in southern Thailand, but we were troubled by how much it seemed like a playground for Europeans and Americans. 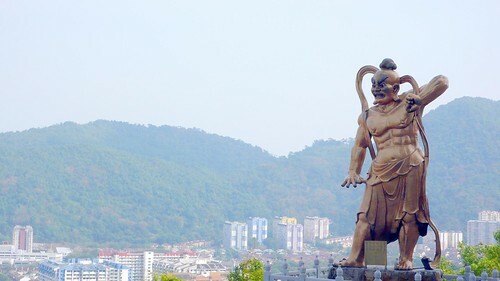 We were longing for a little more interaction with the locals and we got that in Penang. Malaysia rocks! While we were in Ton Sai, we had a couple of really delicious dishes (Penang and Mussaman curries) that we learned were of Malaysian origin. Southern Thailand borders Peninsular Malaysia, so there is a lot of Malay food in Thailand and vice versa. Since Ko Lipe is so close to Malaysia already, we decided to head over…our first stop would be Pulau Langkawi (a resort island) en route to Penang, which is famous throughout SE Asia for its food. From there we would head to Kuala Lumpur. Jeremy really wanted to check out KL because he likes the name. Also, it is a major airline hub, allowing us to fly back to mainland SE Asia for cheap. So there you have it: we went to Malaysia for (1) the food, and (2) because its capital city sounds like “Lumpy Koala.” We are very picky and discerning travelers over here at 12FOOT3. 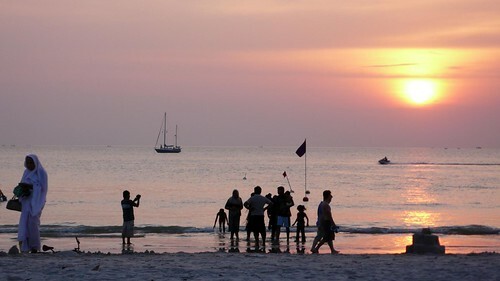 All over Pattaya beach, there are signs advertising a “45 minute speedboat” to Pulau Langkawi, an island on the very northern tip of Peninsular Malaysia. We paid about 1200 baht (approx. US$35) each for the ride over, and we were looking forward to the quick and easy hop over to Malaysia. 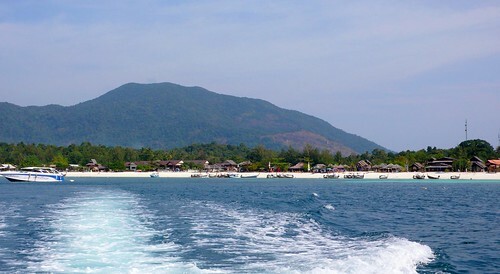 Bye bye Ko Lipe: Pattaya beach as the Langkawi boat speeds away. OK, not so fast: first of all, the trip actually took more like an hour and a half (and the boat left late). We have found that in SE Asia, time estimates can be quite off…what is advertised as a 5-hour bus ride really takes only three; a 45-minute boat ride means you get there an hour and a half later. This wouldn’t be so bad except that this speedboat ride was The. Bumpiest. Boat. Ride. EVER. There were about 10 of us on the boat and we all sat around looking at each other nervously as the boat crashed repeatedly against the waves. At times, it really seemed like the boat could break apart from the turbulence. And, they probably should have warned us, like they do at Sea World, that if you sit in the first 6 rows, you may get very wet. Well, we all had front-row seats and were completely drenched several times throughout the trip. I consider it a minor miracle that no one got sick on the ride. We finally got on land in Langkawi (where they actually have a pier! No wading through the surf to get to shore here) and happily jumped ashore…and waited. And waited. It took about 2 hours for them to process our visas…so, our 45-minute speedboat ride had turned into a 4 hour trip. So much for the quick and easy hop over to Malaysia. We don’t really have much to say about Langkawi because we only stayed there for one night. The Malaysian government has put a lot of resources into advertising Langkawi, and it worked…there seem to be a lot of Asian and European tourists on this island. Accommodation and food can be expensive here (compared to other parts of Malaysia)…we paid about 70 Malaysian ringgit for our room (approx US$20) and probably about 40 ringgit (US$11 or so) for food. In fact, the only thing that is not expensive is the beer. It is the one area in Malaysia where alcohol is duty-free, so a beer can cost as little as 3.50 ringgit (US$1). We spent the afternoon on the beach. Malaysia is a very Muslim country, and it was interesting watching teenagers jump in the water in full clothing and head scarves. On Pantai Cenang in Langkawi. The water here is murkier than it is on the Ko Lipe side, and the beach more crowded with people and vendors trying to sell tourists silly “adventure” experiences like parasailing or riding on something called a “big banana” (a giant inflatable tube that you ride like a horse) being pulled by a speedboat. We preferred Ko Lipe to Langkawi. The next day, we took a ferry from Langkawi to Penang. This boat was thankfully much calmer than the speedboat we took from Ko Lipe. And they showed the Lindsay Lohan version of “Herbie the Love Bug,” which Jeremy was totally entranced by. 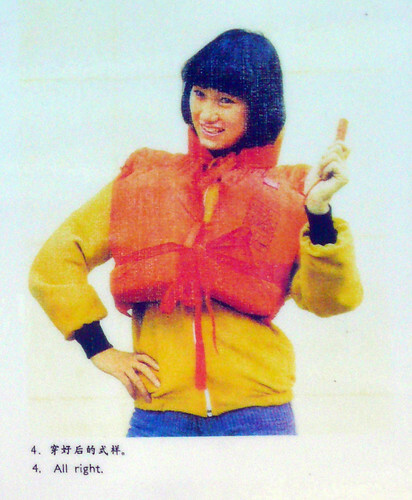 There were also really helpful signs instructing us on how to put on a life vest in case of emergency. The food of Penang deserves its own post (coming up next), but we did do stuff besides eat in Penang (though not much more). We found a great old colonial guesthouse on Love Lane in Penang called Old Penang Guest House. At 50 ringgit (US$14), it was on the more expensive side, but we loved it so much and the people running the place were so nice that we didn’t mind the extra cost. Plus they had free wi-fi, our room had A/C, and there was electricity around the clock. Luxury! 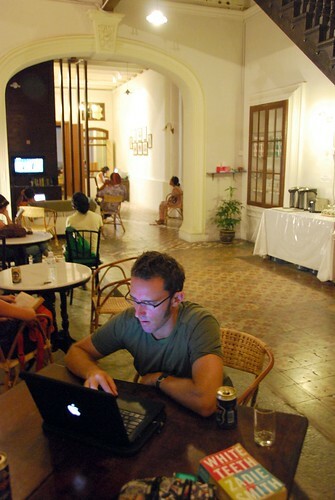 The common area at Old Penang Guest House. 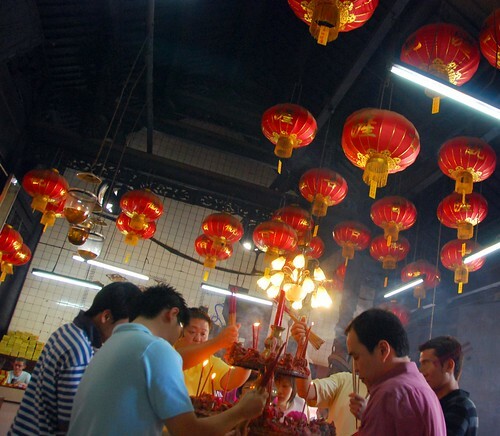 We just happened to come into town at the end of the Chinese New Year celebration…there are lots of Chinese in Malaysia and the festival here is huge, lasting 7 days. 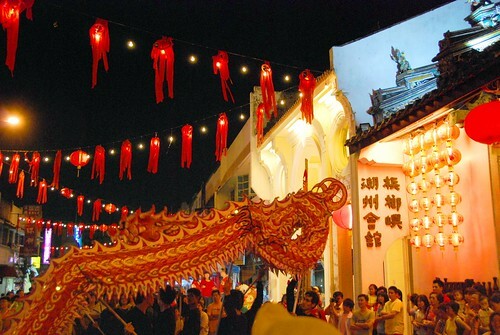 The streets were filled with people watching lion dance performances and generally celebrating the new year. 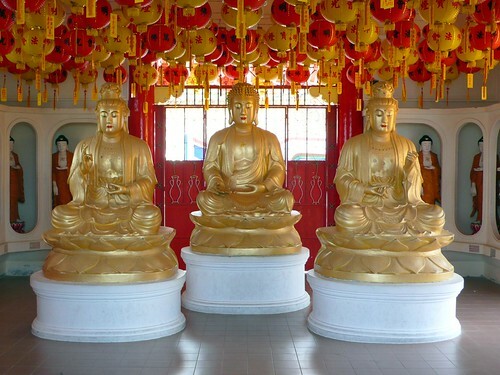 The really wonderful thing about Penang is the clash of cultures that exists here—Chinese, Indian, Malay; Hindu, Buddhist, Muslim, and Christian—it’s all here and everyone seems to get along. It’s quite amazing. There is a city walk that you can do called the Street of Harmony walk because it takes you from a Catholic Church to a Chinese and then Hindu temple, on to a Muslim mosque—all in about 3 city blocks. 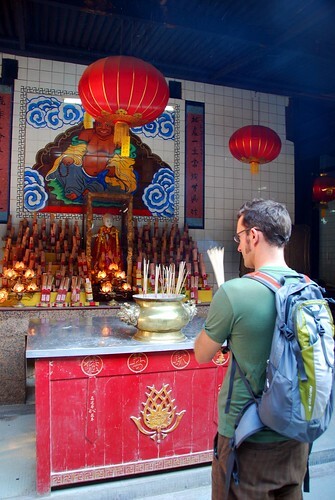 We wandered into Han Jiang Temple one day, where Chinese people were paying their respects to their ancestors at the start of the new year. We decided to take part, so I asked the lady selling incense how to do it, and she taught me (Mandarin comes in really handy in Malaysia) how to burn the incense and paper money at each of the temple urns. 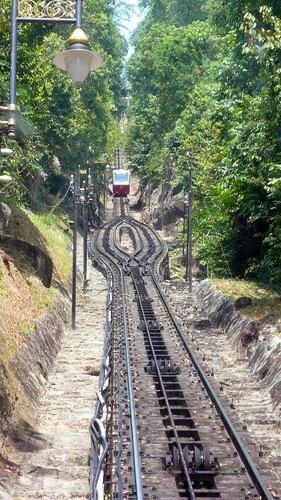 We also took a day trip up Penang Hill one day, where you can ride a trolley up to see views of the city below. 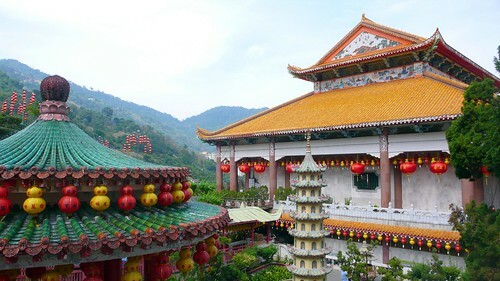 From Penang Hill, you can walk to Kek Lok Si Temple, and absolutely enormous, colorful, and elaborately detailed (some might even say gaudy) Chinese Buddhist temple.